The Kopano OL Extension (KOE) serves as an enhancement to the already included ActiveSync support of Microsoft Outlook 2013, 2016 and 2016 2019 (Windows only, but for both 32bit and 64bit systems). KOE works both with the normally licensed Outlook version, as well as their Office 365 flavours. KOE is available as an exe installer and can be installed before or after creating the actual ActiveSync account in Outlook. For GPO based deployments dedicated msi packages are available for 32bit and 64bit environments. It has to be said that while syncing via ActiveSync works ok for moderately sized mailboxes, the protocol was not made to be used with lots and lots of folders or multiple gigabyte of synced data. Having also a bit of control on the server side, we have implemented the possibility to open folders from shared accounts through Z-Push, while this generally works, problems can arise if working with multiple users in very busy folders. For future versions are are investigating possibilities to enforce certain maximum sizes for mailboxes and amounts of folders. The latest supported version can be downloaded from the customer portal, for community members nightly downloads are available, too. To successfully synchronise the GAB the GAB-Sync script has to be run periodically (setup instructions in the Z-Push Wiki). Depending on the use case the Kopano OL Extension can greatly enhance the user experience of Outlook accounts that have been setup to use ActiveSync. Please be aware that it is by design not a replacement for the old Zarafa Mapi connector. Although we have received reports of Outlook working stable on Inboxes with around 1000 folders and total sizes of up to 10GB, we strongly recommend against the use of ActiveSync for busy shared mailboxes or for mailboxes with large folder structures. For large mailboxes it is possible to enforce a shorter sync period on the server side. Z-Push 2.4 will also implement a webservice to set a shorter sync period per user/device. In addition to this for version 2.0 of KOE we want to implement client side warnings if the synced mailbox is too large or contains too many shared folders. While creating a new profile is optional it always gives the advantage of starting with a clean environment. Technically it is possible to connect to multiple Z-Push enabled servers from within one Outlook profile and even mix it with other account types. Afterwards "Exchange ActiveSync" can be selected as the account type (For Outlook 2013 this option was called "Oulook.com or Exchange compatible service"
Account details can be given on the next page. Users are able to either synchronise the whole mailbox or only one month of data for each folder. All the data that is accessible in Outlook needs to be synced to the local disk first. To reduce the time needed for synchronisation it is recommended to limit the sync timeframe either in Outlook or through Z-Push. Please make sure to have enough disk space to be able to sync the whole mailbox of a user. After this step the account settings are tested and the account can be used. Once installed KOE will add another tab to the Outlook Ribbon from which the user can control the extension. To be able to synchronize the GAB, the administrator of the server has to set this up in the first place. Please refer to https://wiki.z-hub.io/display/ZP/Configuring+GAB-Sync+for+Kopano+OL+Extension for instructions on this. In the Out of Office Assistant screen the user can enable his oof message. For convenience the previous oof message will also be fetched from the server, so that the user can easily adapt and reuse it. KOE will at startup check if the oof message is active on the server and will ask the user if he wants to disable it. Due to the way we achieve shared folder functionality in ActiveSync, everything you open this way will be treated by the client as your own data. Causing for example notifications on additionally opened calendars (see https://jira.kopano.io/browse/KOE-12) and displaying information from items marked as private by its owner (With the introduction of https://jira.z-hub.io/browse/ZP-1063 in Z-Push 2.3.3 we therefore exclude the sync of private items in shared folders). You can find some deeper technical information about the shared folder implementation over at the Z-Push Wiki. The shared folder functionality can be easily accessed through the option "Shared Folder". Once the user has clicked "Shared Folders" he will be presented with a dialogue allowing him to to choose between opening a folder from the public store or searching for a specific user. To select a specific user the user can be selected from a dropdown listing all users in the GAB. The elements in the dropdown can be searched by typing into the field above it. The lookup of usernames in this dialogue will only succeed once the GAB has been synced to the client. To be able to list folders of the desired user, at least the "list folders" right has to be given for the root of the mailbox. When opening a folder the user also has the possibility to give the folder an unique name. KOE will suggest a folder name following the schema "Foldername - Username". Once the user has clicked "Open" the folder will be added to the sync profile in Z-Push and will start added to Outlook with the next synchronisation. It is possible to customise the format of the suggested folder name from the Plugin Debugger. A once opened folder can be closed through the same menu option by simply deselecting the checkbox in front of the folder. If there are no other folders opened from that specific user, then the user will not be displayed in this dialogue anymore when it is opened the next time. The 2.4.0 release of Z-Push brought the general availability to not only open individual folders from another store, but instead open the whole store as an additional account. While this has the technical limitation in Outlook that messages cannot be moved between stores it we are confident that this will provide a better user experience for users that need medium to large amounts of shared folders. The technical background is explained within the Z-Push Wiki, this explanation also includes how this feature can be configured without relying on KOE (in case KOE runs into an error, or the feature should be used on a mobile phone or tablet. This feature requires both Z-Push 2.4.0 and KOE 2.0. Opening complete stores works similar to opening individual folders and can be accessed through the option "Shared Folder". The lookup of usernames in this dialogue will only succeed once the GAB has been synced to the client. Additionally to this the gab is also required to discover the email address of the account, therefore opening a shared store is not possible if the GAB has not yet synced to the client. After the restart the shared store will be visible as as additional account in Oulook. Please be aware that sending as a shared store still requires that the store owner has either given delegation rights to the user or an administrator has set up send-as permissions. To close a store just perform a right click on the desired store and choose "Close Accountname". Alternatively can the store be removed directly from the account manager. To enable appointment reminders the user has to click on the calendar in the shared folders menu and ticket the checkbox "Show Reminders". Since the release of version 1.1 of KOE it was already possible to manually add a differing From address and use this address to send mails (given that the user has the correct permissions to do so). 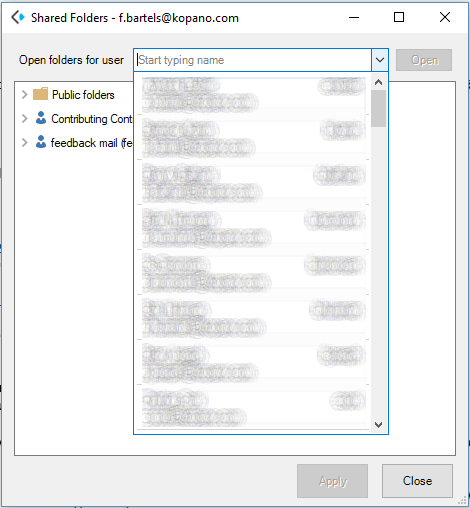 Starting with KOE 1.2 the From address is automatically set to the email of the shared folder, when replying from this folder (to mirror the behaviour of WebApp and Outlook in general). Optionally this can be deactivated from the shared folder dialogue. I can only see free/busy data in shared calendars / I get a message that the "calendar could not be updated"
When using the "Open Calendar" button Outlook will do an automatic fallback to display only the free/busy data of the requested user. If more detailed information should be shown the Open Shared Folder feature of KOE needs to be used. For smaller and less common tasks, like for example changing the permissions of a shared folder, the user can quickly open the WebApp from within KOE. To redirect the user to the correct WebApp KOE uses the same Autodiscovery DNS entry that is also used for Kopano DeskApp. Starting with version 1.5 the suggested displayname of shareds can be influenced by the administrator. It can be set using the registry value 'SharedFolders\DefaultFolderNameFormat', or through the plugin debugger. The default value is '%foldername% - %username%' (same as it was in previous versions). The available fields are the same as for signatures, and %foldername%. In the settings screen the user can select from which ActiveSync account he wants to retrieve the GAB (by default KOE will retrieve the GAB from the first ActiveSync account). This screen can also be used to change the Loglevel to aid debugging issues with a developer. Additionally the Plugin Debugger (which can be found as PluginDebugger.exe in the installation directory of KOE) can be used to disable certain parts of KOE, such as the GAB or the shared folder feature. This tool can also be used to define a custom location for the PST file to store the local copy of the GAB (this only applies to the PST file of KOE itself and not to the OST of the account in general).